Studies in the Mason Lab focus primarily on the red-sided garter snake (Thamnophis sirtalis parietalis). 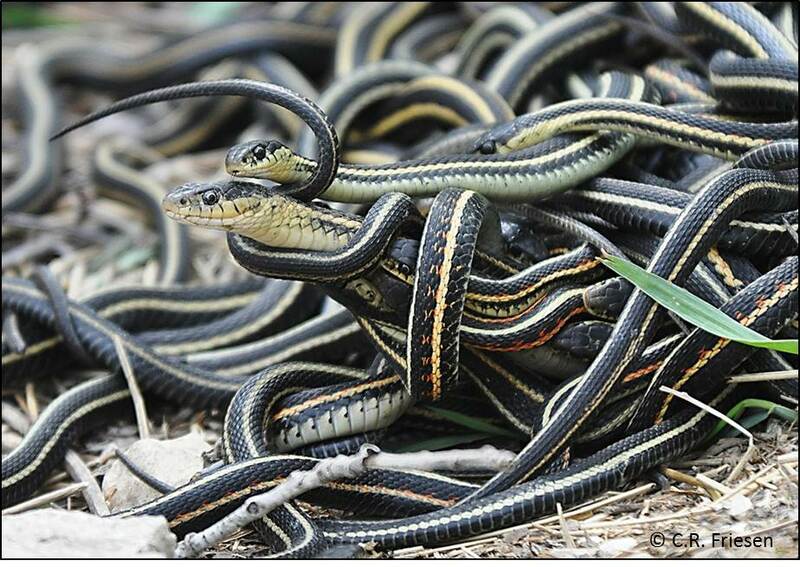 In the past, however, we have studied several species and subspecies of garter snakes locally. We have also extensively studied the reproductive biology (chemical ecology, endocrinology, behavior) of the brown tree snake (Boiga irregularis), but recently the focus has been solely on garter snakes. Dr. Mason has also collaborated with Dr. Shine to study the chemical ecology and reproductive biology of two species of coral snakes. Since 1991, the Mason Lab has been studying the biology of the red-sided garter snake (Thamnophis sirtalis parietalis) in the northernmost extent of its range in the Interlake Region of Manitoba, Canada. We have also conducted research on two local species of garter snakes (T. s. concinnus, T. ordinoides) which provide us with a rich comparative context for our numerous research areas. Lastly, we have also incorporated a sympatric species of garter snake (T. radix) that overwinters with T. s. parietalis in Manitoba.